Our government continues its course: admit as few Syrian Christians as possible. See my post of August 28 – apparently this statistic of 83 was too generous. The numbers were inflated for Syrian Christians. But the rest of this post is accurate as to what is happening. Syria continues to burn, Christians are routinely — ROUTINELY – massacred, raped, kidnapped, enslaved and yet we have allowed in a grand total of ………… eighty-three Christian survivors. Displaced Syrians include those wanting to get away from ISIS and other jihadist groups, those fleeing from atrocities carried out by the Assad regime – dominated by a minority Shi’a sect that has targeted Sunnis in particular – and its Hezbollah, Iranian and Russian allies, and Syrians simply wanting to escape the chaos and deprivation of the conflict. 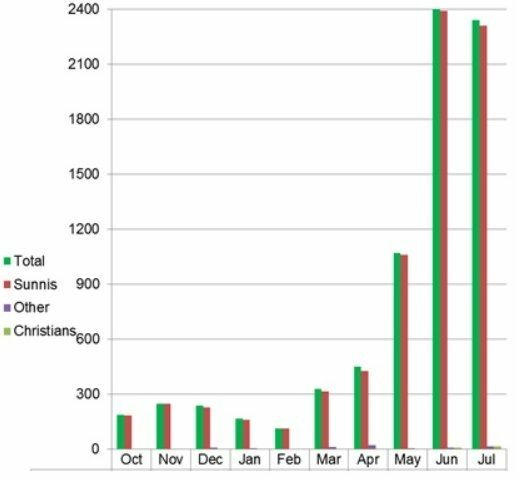 Although Syrians of all ethnic groups and religious denominations have been caught up in the crisis, the number of Christians among refugees admitted into the U.S. is still disproportionately small: Some 10 percent of the Syrian population is Christian, and yet Christians account for less than one percent of refugees admitted to the United States. On the other hand, Sunnis comprised around 74 percent of the Syrian population when the war began, while the proportion of Sunnis admitted to the U.S. exceeds 97 percent. Of a total of 9,424 Syrian refugees resettled in the U.S. since the conflict broke out,83 (0.8 percent) are Christians, and 9,151 (97.1 percent) are Sunnis. ——– Frankly, I’m surprised we even let in those eighty-three survivors. I suppose one must keep appearances though.